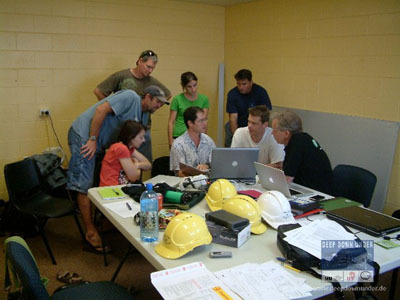 Scientific team meeting with Dr. Rob Beaman (JCU), discussing underwater maps. 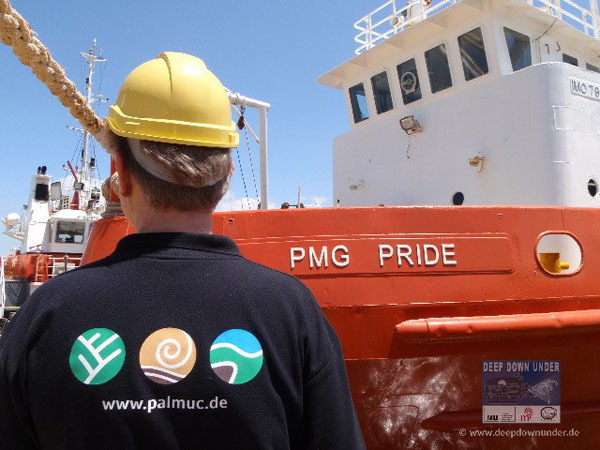 PMG Pride during loading in Townsville. 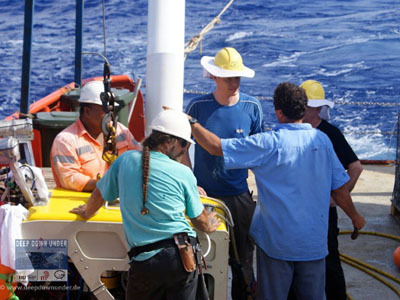 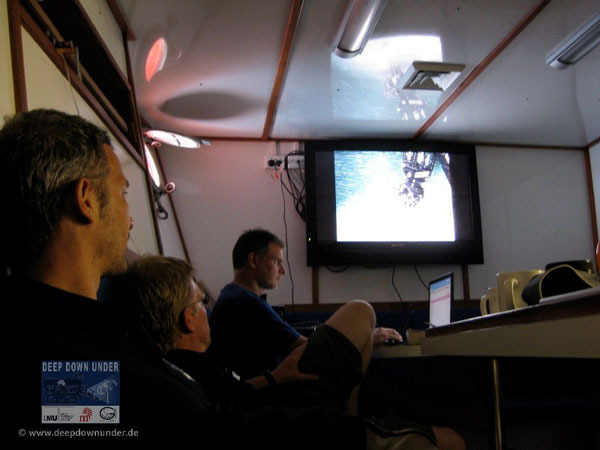 Nico, Andy, Gert and Werner discuss camera attachment on ROV. 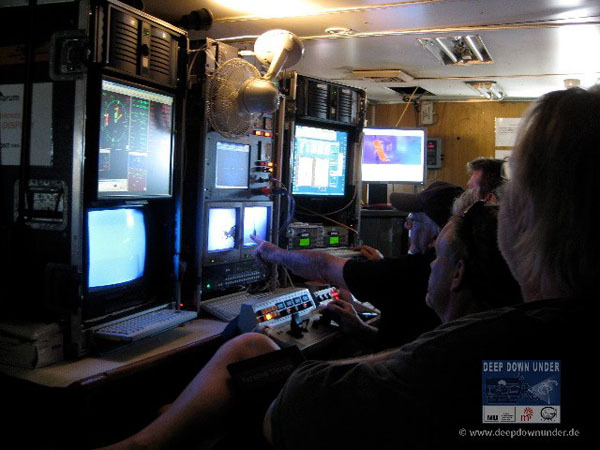 View from the bridge on PMG Pride's back deck. 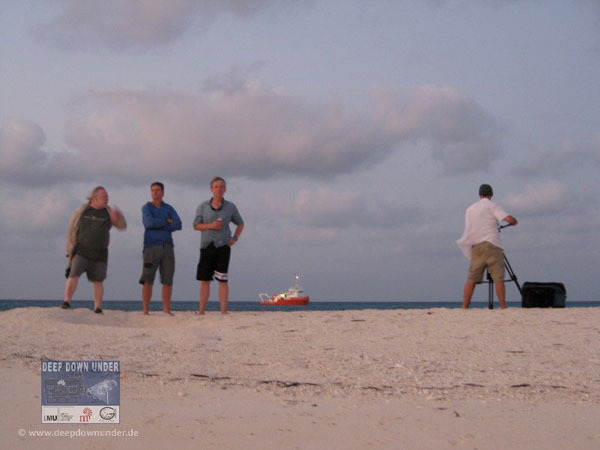 Marcos films Cat, Dan & Gert during departure. 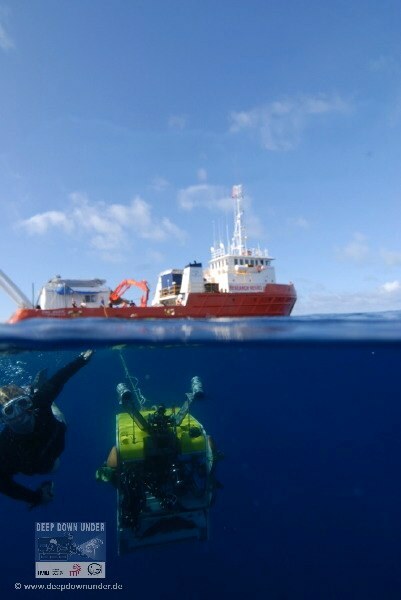 Getting ready for a SCUBA dive. 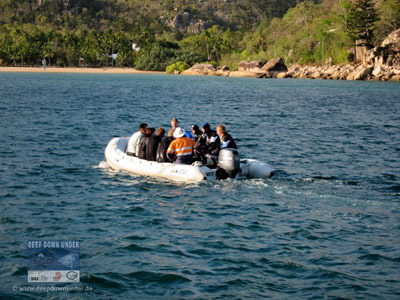 To first check out dive at Magnetic Island. 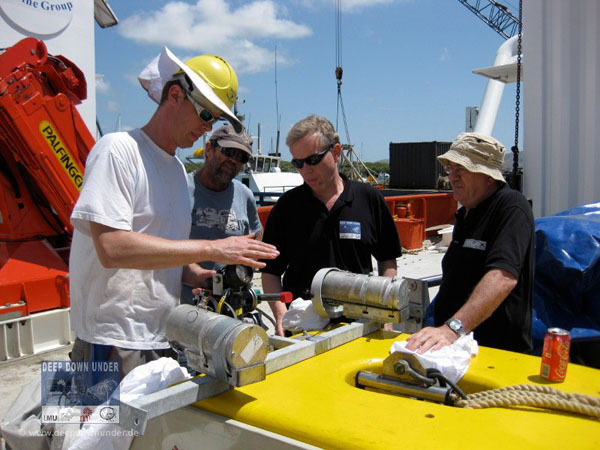 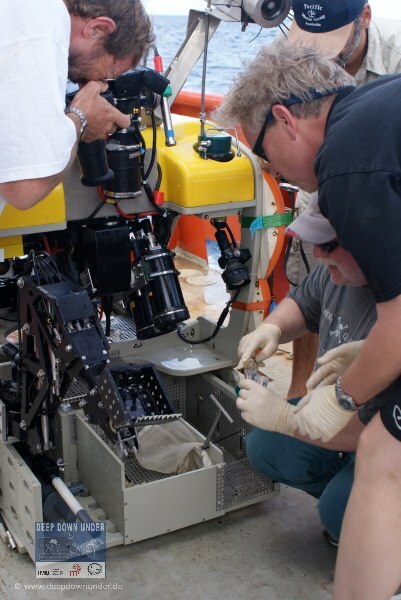 ROV pilots and crew discuss ROV deployment. 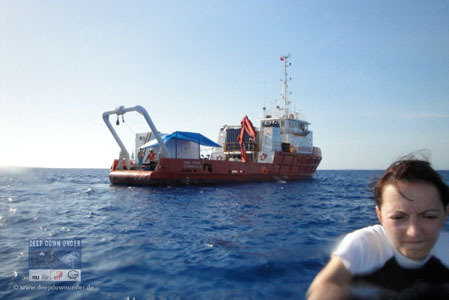 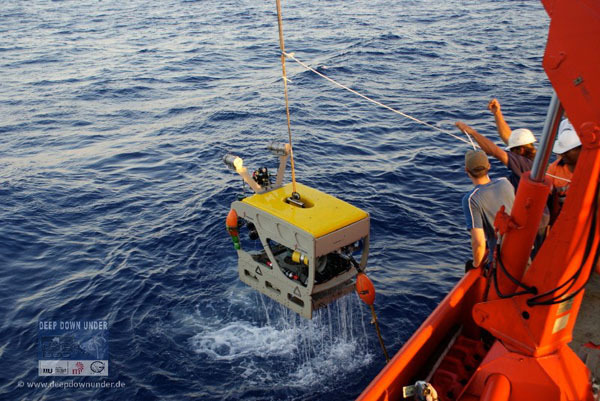 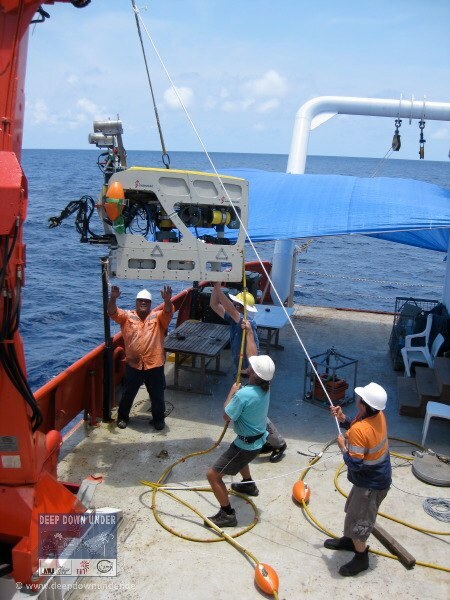 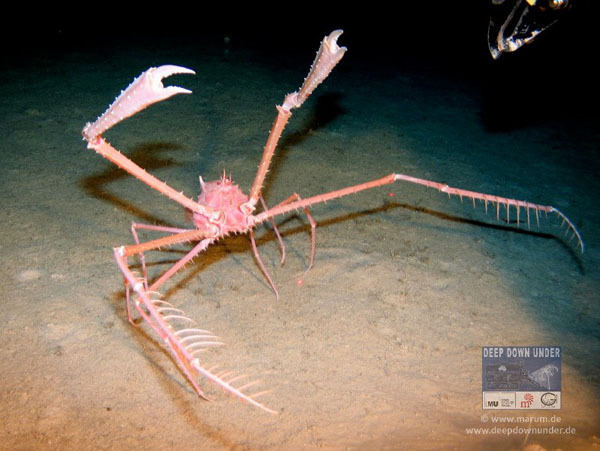 ROV recovery after first successful dive. 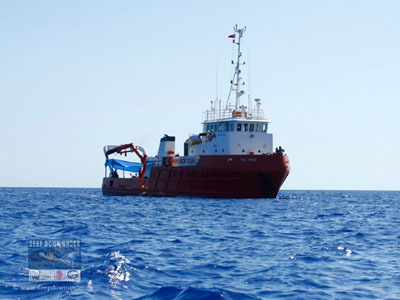 Filippo and Kingy on deck with winch and ROV. 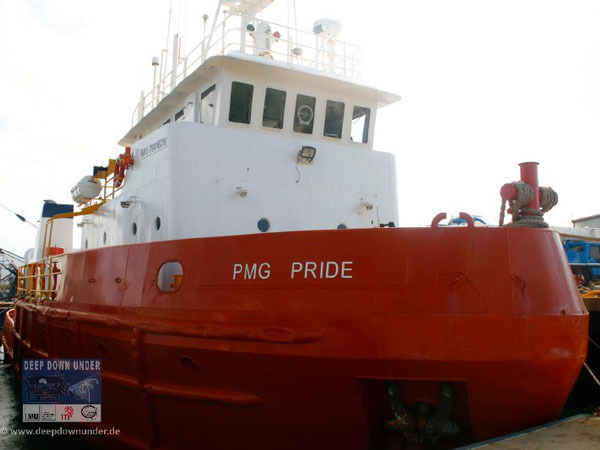 Afterdeck of PMG Pride (and Klemi). 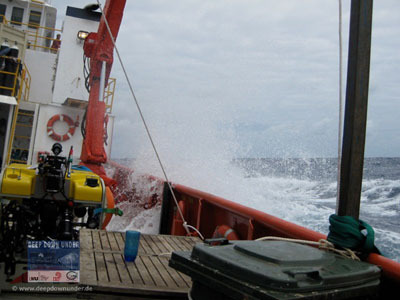 Early evening at sea while steaming slowly. Joachim, Merrick and Gert (and Marcos filming the PMG Pride) on sand cay at Flinders Reef. 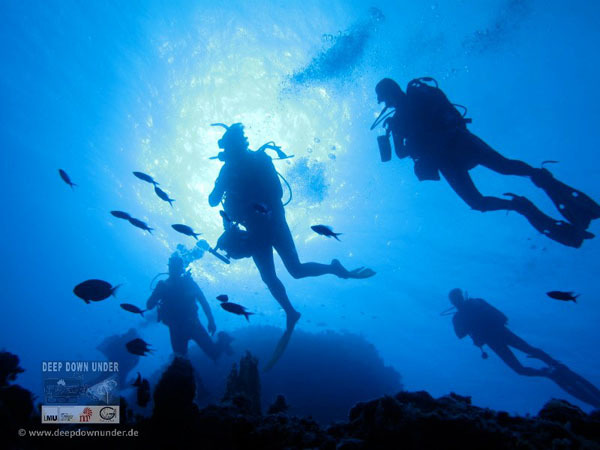 SCUBA diving in the Coral Sea. 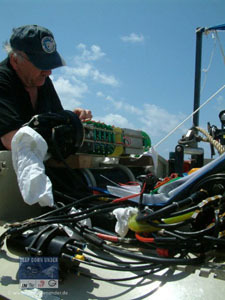 Gert and Joachim inspect samples. 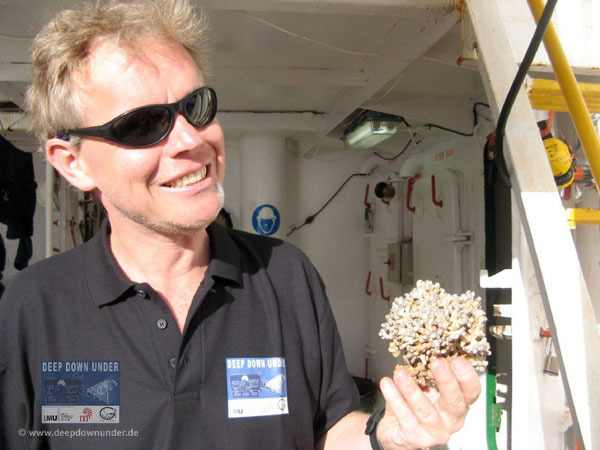 Gert with new species of Vaceletia (happy man). 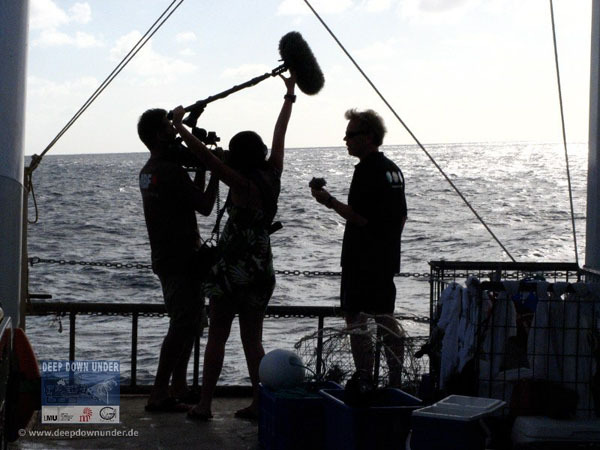 Gert being interviewed on back deck. 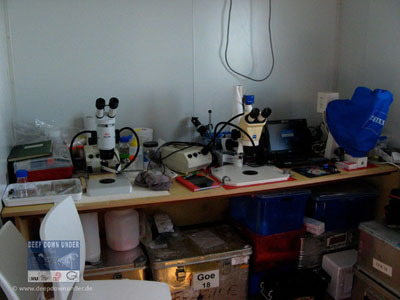 Klemi in the lab preparing samples. 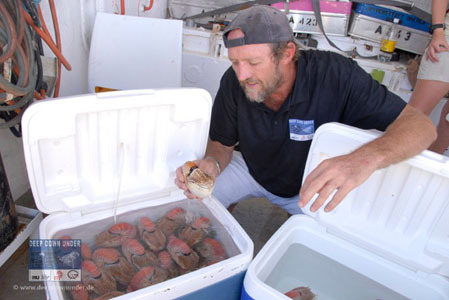 PMG Pride close to reef, with Paul fishing tonights dinner. 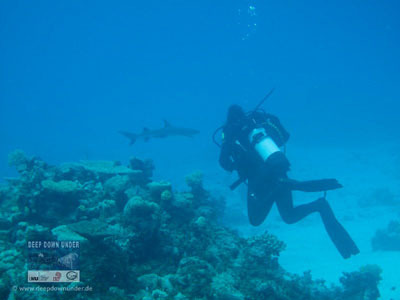 Melia with whitetip reef shark. 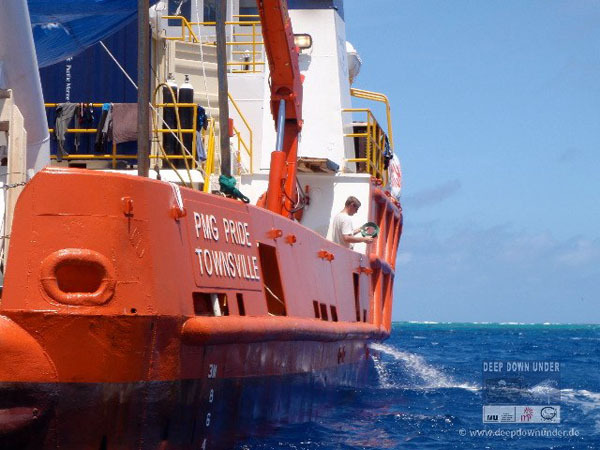 PMG Pride steaming with waves crashing on deck. 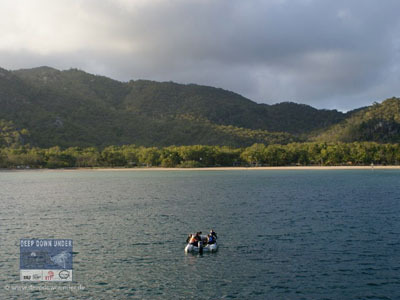 At Bougainville Reef (old wreck on reef in background). 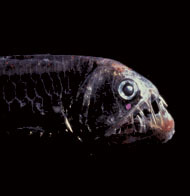 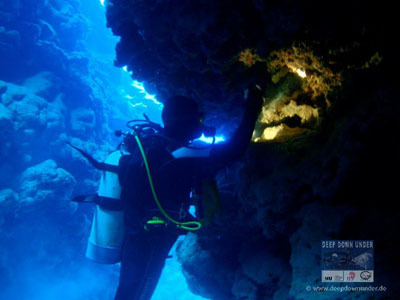 Gert at work under water in a cave. 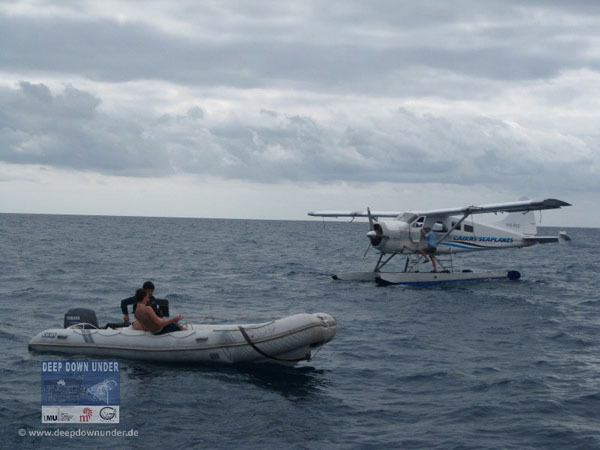 Seaplane delivering spare parts at Osprey Reef. 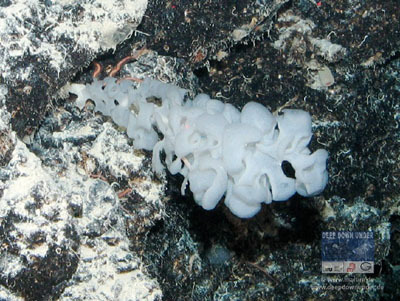 Farrea sp., a hexactinellid (glass) sponge at Osprey Reef, about 500m depth. 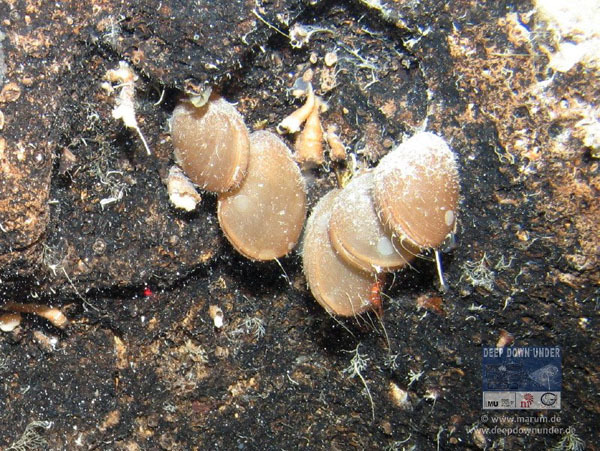 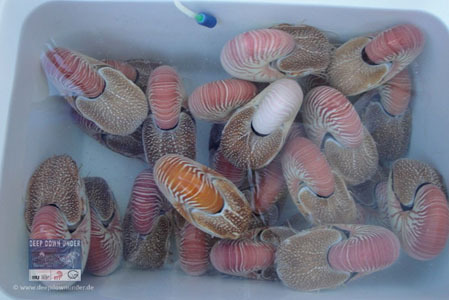 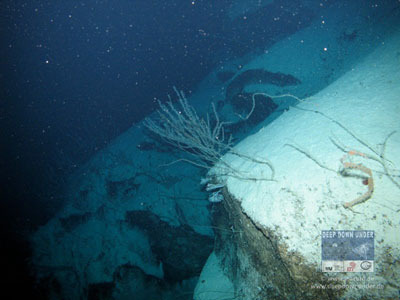 Brachiopods (lamp shells) at Osprey Reef, about 400m depth. Deep-water scenery at Osprey Reef. 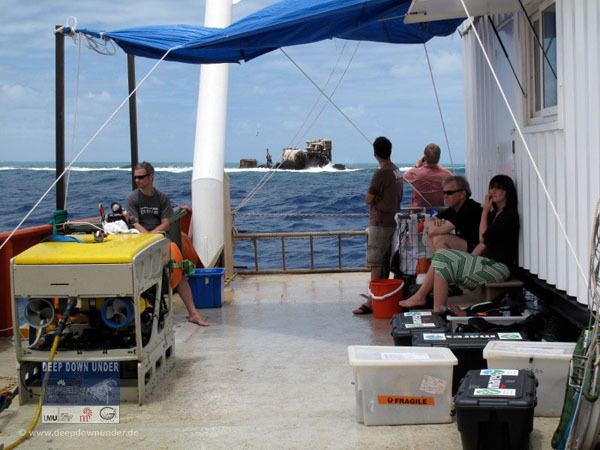 ROV, PMG Pride, and Gert at Osprey Reef. 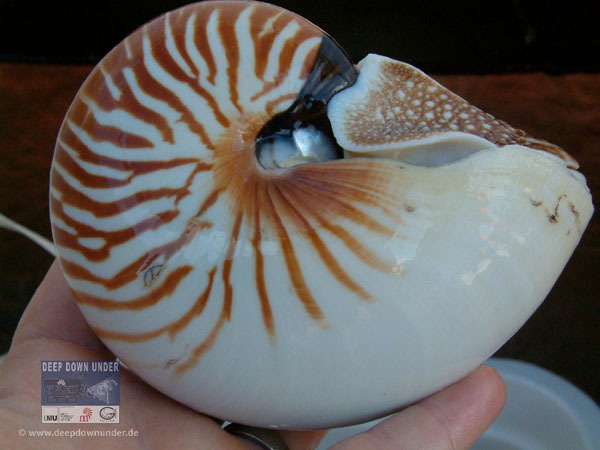 An eski full of Nautilus. An ophiuroid on a rock in several hundred meters of water. 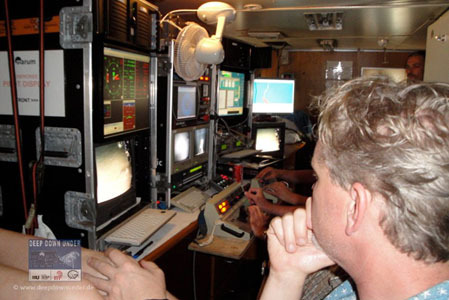 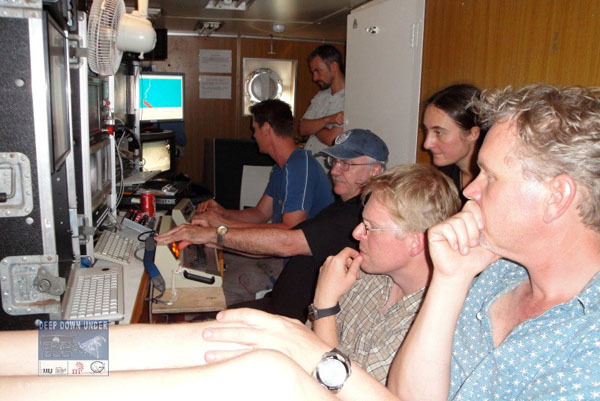 Scientific crew watching the ROV on big flat screen in the ship's mess (Dan, Carsten, Merrick). Andy with his beloved critters. Underwater scenery at about 500m depth. 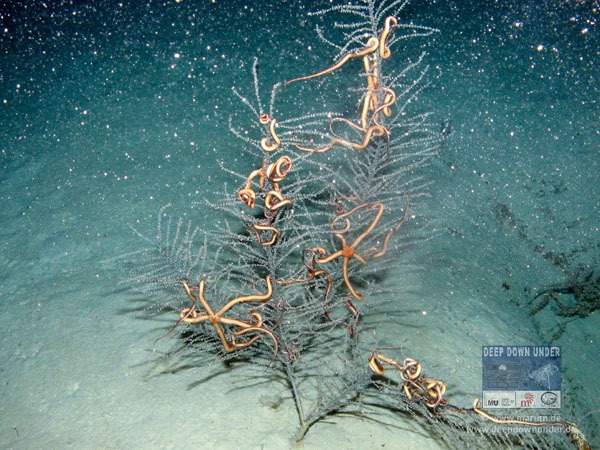 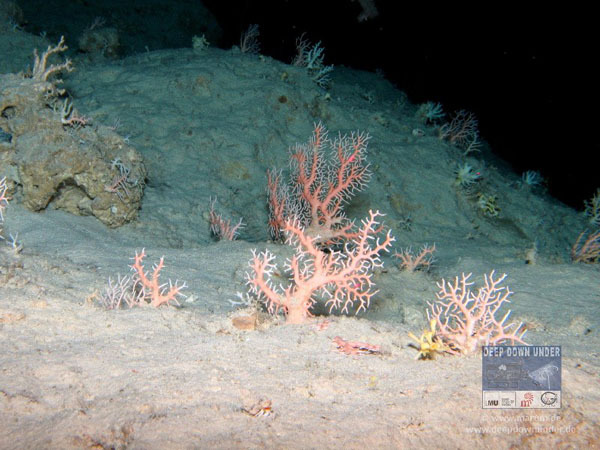 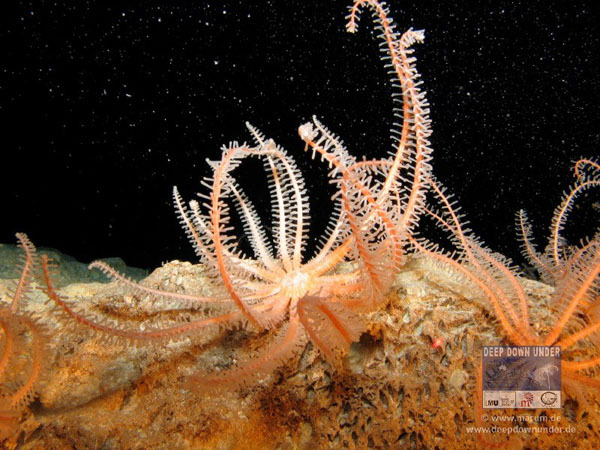 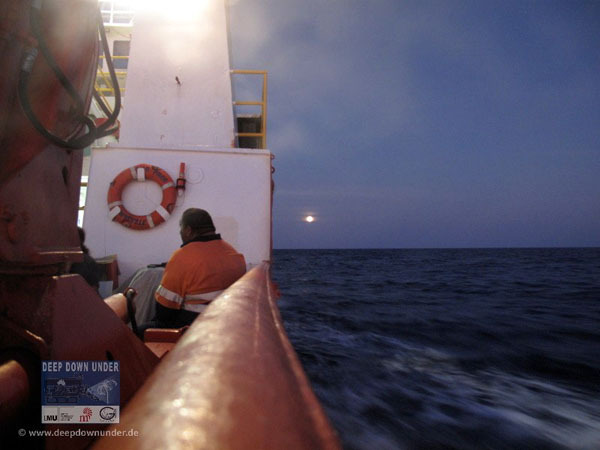 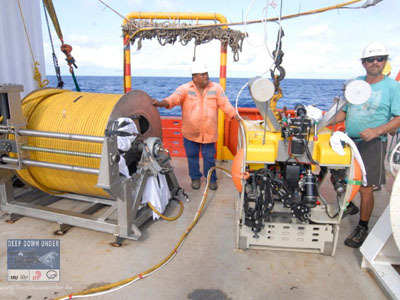 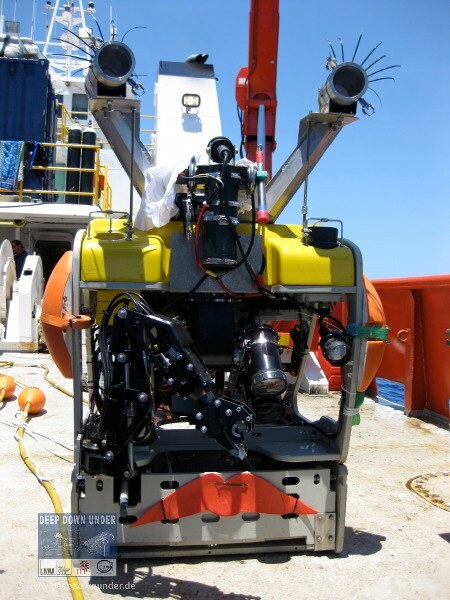 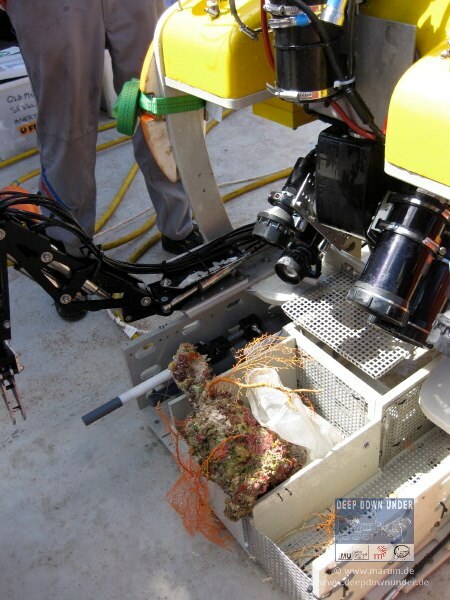 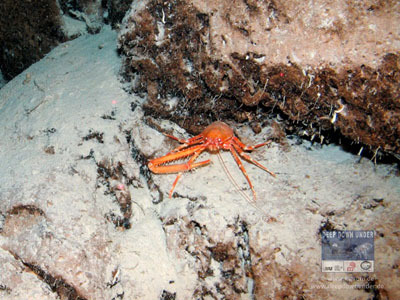 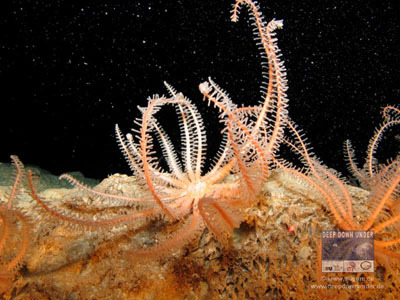 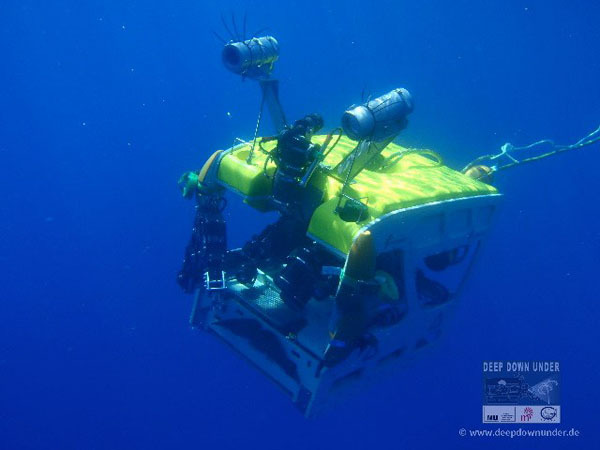 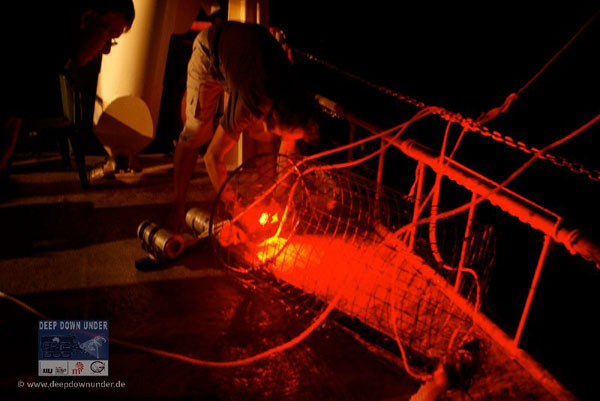 The ROV's collecting basket full of deep water octocorals. 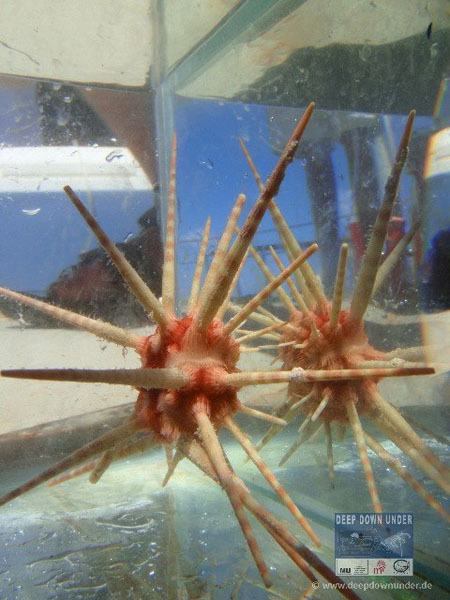 A deep water cidarid sea urchin (in an aquarium on deck). 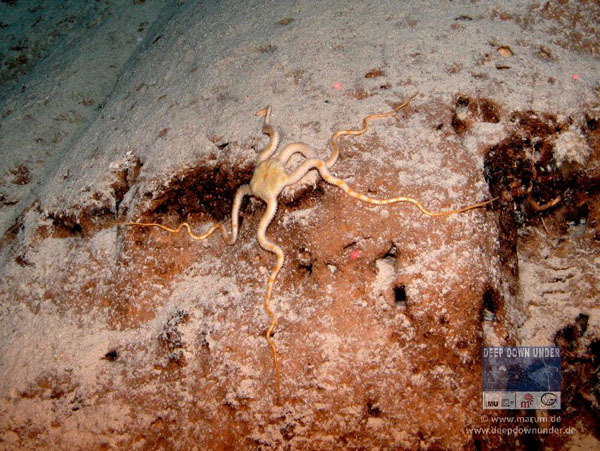 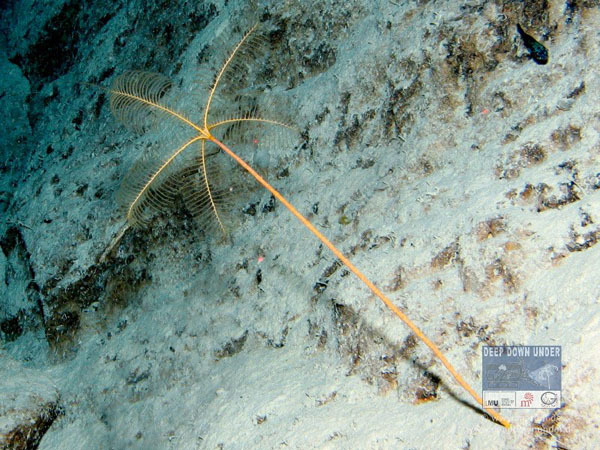 A stalked crinoid (sea lilly) in about 500m depth at Osprey Reef. Gert and Joachim sampling from the ROV's collecting basket. 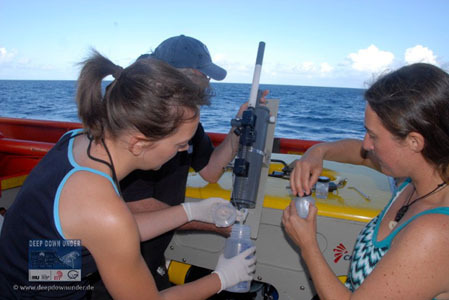 Klemi and Nadia sampling water from Niskin bottle. 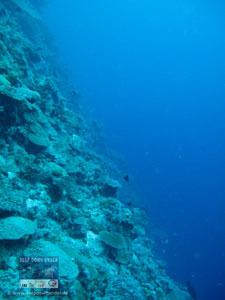 A steep coral sea wall at Bougainville Reef. Basket stars at Bougainville Reef in a few hundred meters water depth. 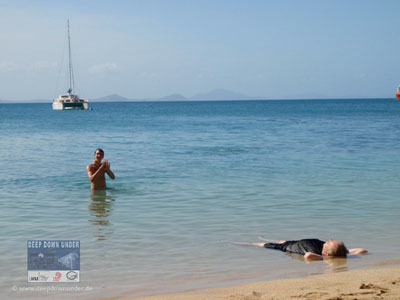 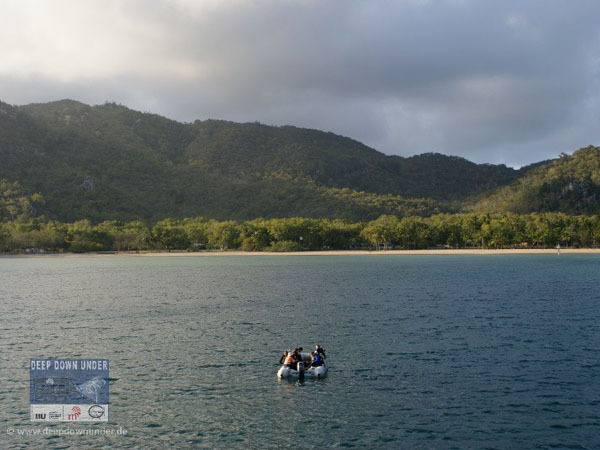 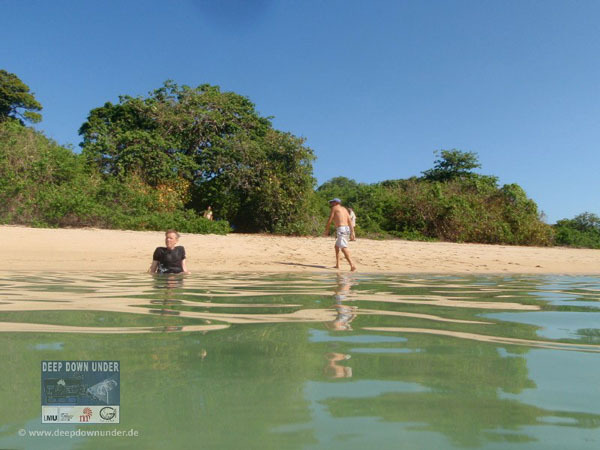 Relaxing in the warm shallow waters of the GBR (Hope Island) after an exhausting expedition. 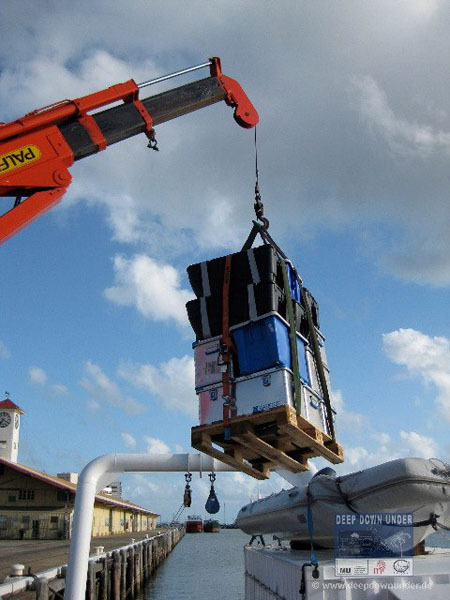 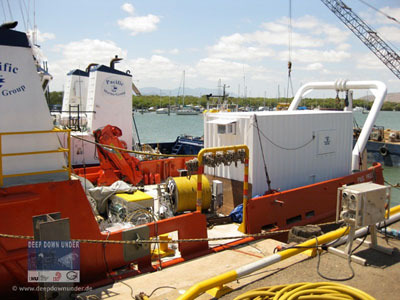 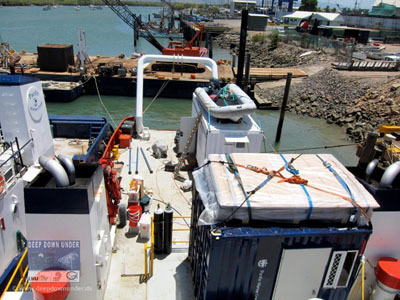 Unloading the equipment in Cairns.